L=164mm/W=125mm/H=300mm. Canisters 5 litre made of tinplate, inside blank and outside white lacquered. UN-Approval for dangerous goods! Inclusive pull-out spout closure with tamper-evident seal. Canisters made of tinplate – Metal packaging with UN-Approval for dangerous goods! 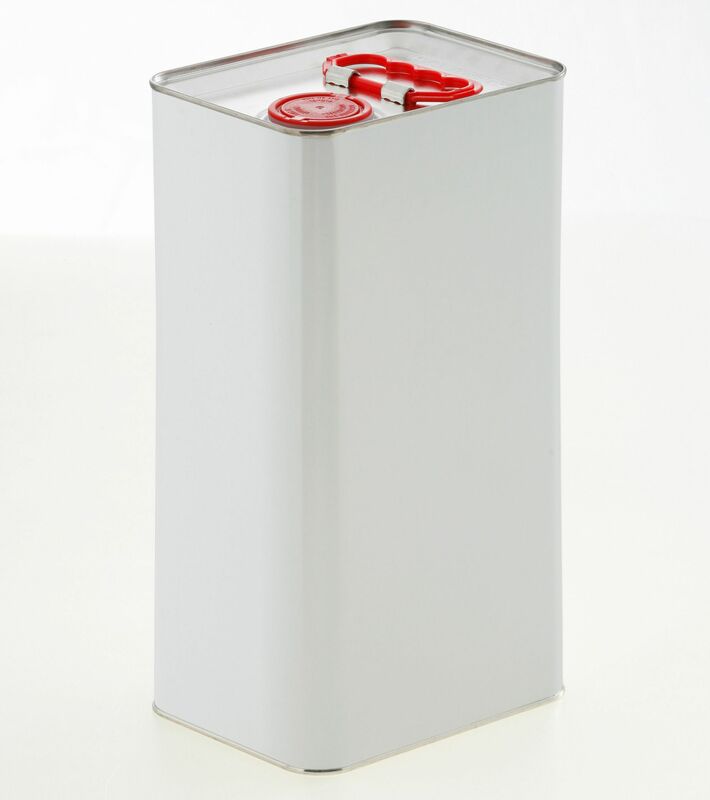 The rectangular metal canisters are used in the chemical-technical industry as well as in the food industry: for alcohol as well as thin fluid solvent-based filling products (VOC), but also liquid hazardous goods, brake fluids, polish, cleaning supplies, engine oils, thinners, hardeners, paint, varnish, glazes and cooking oils. All Canisters are made of tinplate (tinned sheet steel). Canisters made of tinplate without an appropriate inside coating are not suitable for water-containing filling goods or moist storage/handling. Contact with water or moisture can lead to rust. The Canisters are inside blank and outside white lacquered (bottom and top silver). All Canisters are suitable for food. The Canisters are delivered with extricable red 42 mm pull-out spout closures with tamper-evident seal. Canister with red, foldable carrying handle made of plastic on the top side.